The Elevation Spa at ‘The Tamara Coorg’ is all about a luxurious getaway away from urban chaos that allows you to reconnect with nature. 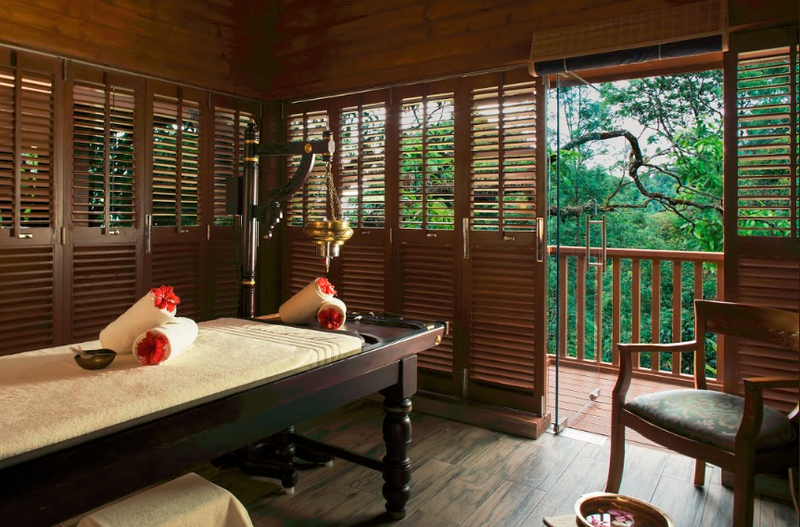 The Elevation Spa at ‘The Tamara Coorg’ is located within a 100-year-old plantation bungalow. 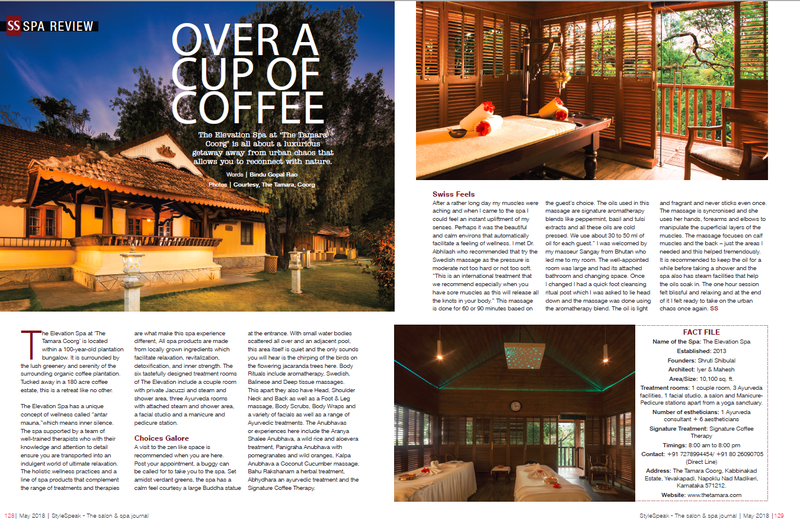 It is surrounded by the lush greenery and serenity of the surrounding organic coffee plantation. Tucked away in a 180 acre coffee estate, this is a retreat like no other. The Elevation Spa has a unique concept of wellness called “antar mauna,”which means inner silence. The spa supported by a team of well-trained therapists who with their knowledge and attention to detail ensure you are transported into an indulgent world of ultimate relaxation. The holistic wellness practices and a line of spa products that complement the range of treatments and therapies are what make this spa experience different, All spa products are made from locally grown ingredients which facilitate relaxation, revitalization, detoxification, and inner strength. The six tastefully designed treatment rooms of The Elevation include a couple room with private Jacuzzi and steam and shower area, three Ayurveda rooms with attached steam and shower area, a facial studio and a manicure and pedicure station. A visit to the zen like space is recommended when you are here. Post your appointment, a buggy can be called for to take you to the spa. Set amidst verdant greens, the spa has a calm feel courtesy a large Buddha statue at the entrance. With small water bodies scattered all over and an adjacent pool, this area itself is quiet and the only sounds you will hear is the chirping of the birds on the flowering jacaranda trees here. Body Rituals include aromatherapy, Swedish, Balinese and Deep tissue massages. This apart they also have Head, Shoulder Neck and Back as well as a Foot & Leg massage, Body Scrubs, Body Wraps and a variety of facials as well as a range of Ayurvedic treatments. The Anubhavas or experiences here include the Aranya Shalee Anubhava, a wild rice and aloevera treatment, Panigraha Anubhava with pomegranates and wild oranges, Kalpa Anubhava a Coconut Cucumber massage, Bahu Rakshanam a herbal treatment, Abhydhara an ayurvedic treatment and the Signature Coffee Therapy. After a rather long day my muscles were aching and when I came to the spa I could feel an instant upliftment of my senses. Perhaps it was the beautiful and calm environs that automatically facilitate a feeling of wellness. I met Dr. Abhilash who recommended that try the Swedish massage as the pressure is moderate not too hard or not too soft. “This is an international treatment that we recommend especially when you have sore muscles as this will release all the knots in your body.” This massage is done for 60 or 90 minutes based on the guest’s choice. The oils used in this massage are signature aromatherapy blends like peppermint, basil and tulsi extracts and all these oils are cold pressed. We use about 30 to 50 ml of oil for each guest.” I was welcomed by my masseur Sangay from Bhutan who led me to my room. The well-appointed room was large and had its attached bathroom and changing space. Once I changed I had a quick foot cleansing ritual post which I was asked to lie head down and the massage was done using the aromatherapy blend. The oil is light and fragrant and never sticks even once. The massage is syncronised and she uses her hands, forearms and elbows to manipulate the superficial layers of the muscles. The massage focuses on calf muscles and the back – just the areas I needed and this helped tremendously. It is recommended to keep the oil for a while before taking a shower and the spa also has steam facilities that help the oils soak in. The one hour session felt blissful and relaxing and at the end of it I felt ready to take on the urban chaos once again. Treatment rooms: 1 couple room, 3 Ayurveda facilities, 1 facial studio, a salon and Manicure-Pedicure stations apart from a yoga sanctuary. 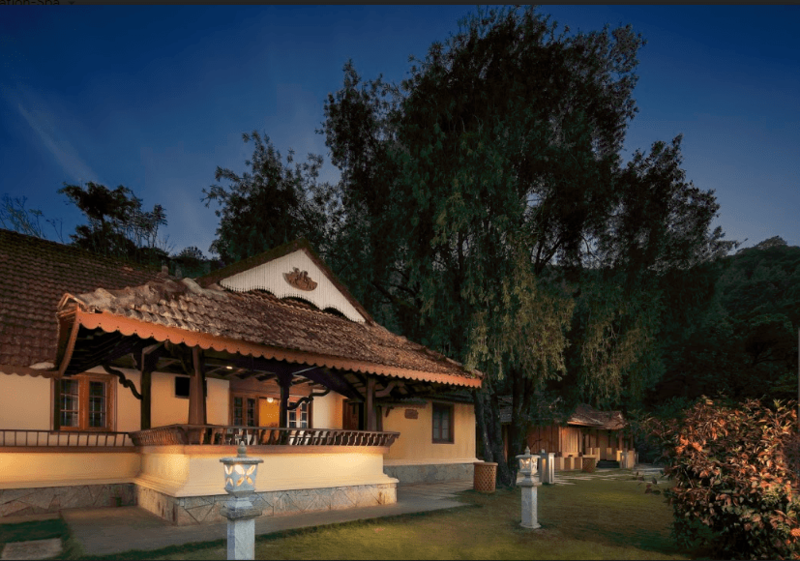 Address: The Tamara Coorg, Kabbinakad Estate, Yevakapadi, Napoklu Nad Madikeri, Karnataka 571212. Also check my posts on the Birds of Tamara here.